Chelsea loves practicing the high block, Cole likes saying “Kiai” (kee-yah) and Will takes a shine to kicking. Sounds like a typical elementary-school-aged kids’ response to beginning karate classes except these are children with special needs and the classes are just one way their rehabilitative school goes beyond the norm in expanding their daily learning process. Great Strides Rehabilitation has been providing speech, physical and occupational therapy services for Northeast Florida for more than a decade with their main clinic, school and outpatient therapy support. 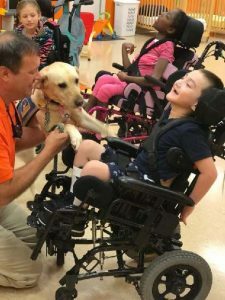 Although they are located in Mandarin as part of the Jacksonville Pediatric Enrichment Center, their therapists also help children with disabilities at schools and medically fragile day care centers. Also located within this large Mandarin business complex on San Jose Boulevard is Pak’s Karate Academy of Mandarin, a mainstay in this area for 31 years. Dr. Jon Edenfield, OTD, OTR/L, founder and executive director of Great Strides, wants his students to engage in a variety of leisure activities to help with their motor and social skills in a fun way. “Many special needs children have a hard time participating in sports teams or other typical activities such as riding a bike, and when they do, it can be a negative experience causing them to become self-conscious of their own behaviors which can lead to poor self-esteem,” said Edenfield. When the students walk to the play ground each school day, they actually pass the Pak’s Academy building. One day about six months ago, when one of Pak’s owners, Master Christopher Tersak, saw the children, he approached the therapists with the group and struck up the idea of having the kids participate in some basic karate classes at no charge. Edenfield already knew the benefits of karate for special needs children, especially those in the autism spectrum, in developing better balance, motor coordination, focus on a task, and improved eye contact and social skills. 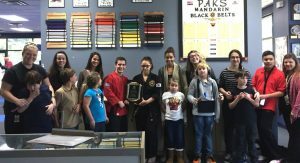 Tersak saw this as an opportunity to give back to the community and fulfill their core mission to extend the benefits of karate to all people, especially those with challenges and behavior issues. Working with the Great Strides’ students also challenges and grows Pak’s teachers to become more patient and understanding in their instruction methods. They are starting to receive feedback from the kids’ therapists and parents that the classes are showing a positive impact on the students’ everyday lives. “That is our payment because that is why we do it,” said Tersak. Recently, Edenfield attended his students’ first ceremony at Pak’s Academy, watching six to eight year olds pay strict attention to instructions and beam with pride after breaking their first boards. “It’s obvious the children are really into it and their behavior and focus improvements are extending into other crucial communication areas as shared by their parents,” said Edenfield. For more information about Pak’s of Mandarin call 262-8200 or go to paksmandarin.com; to reach Great Strides Rehab call 886-3228 or visit greatstridesrehab.com. I spoke with Joni Hughes who is recent owner of a new PPEC in town “Jumpstart Pediatrics”. PPEC stands for Prescribed Pediatric Extended Care and is a daycare option for medically fragile children who would not be appropriate for typical daycare due to medical issues. In the past, parents working or in school often kept medically fragile children home with round the clock nursing care. Therapy was provided in outpatient locations or through Early Steps around the parent’s schedule. Now more parents are learning about PPECs as an option for their child, and there are many more PPEC choices in Jacksonville. PPECs are staffed by skilled nurses who medically care for the children. Therapy is provided “in house” and includes PT, OT and ST as well as vision and hospital homebound schooling options. This cuts down on multiple additional appointments for the parents during the week and often fits their school/ work schedule better. Transportation is provided if needed, with buses or vans picking up the children in the morning and transporting them home. Medical personnel accompany the children on the bus rides to ensure their safety. Great Strides began staffing therapists at PPECs about 10 years ago, and has steadily grown with these companies. Joni responded to several questions about her experiences in this medical business. What is your background medically? How did you decide to open a PPEC? How long has Jumpstart been open and how many children can it serve? What services does GSR provide for your PPEC? How long have you been contracting with Jon Edenfield and GSR? What is the mission of your program? Tell me about your family, and what you like to do in your spare time. “I’ve been married for 30 years, have 4 children and 4 beautiful grandchildren. Family is very important to me. “The program is not just to teach a certain job skill until proficiency has been met but also focuses on a comprehensive package for each individual on what skills are needed to be successful in a community job – self help, social skills, self advocacy, safety and time management.” After those stages have been taught and met the student will work on specific job areas that interest each individual. A win-win for student and partnering companies. Great Strides appreciates Westminster Woods on Julington Creek, and Mama Fu’s on San Jose having graciously allowed Great Strides to work with them on potential future employment and great on-the-job training for our students. We are always looking for new opportunities to provide our clients with many different employment choices throughout the community. If a company is interested in partnering with us, they should call the main office at 886-3228. 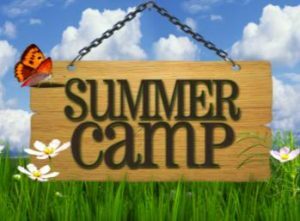 This year’s summer camp is an eight week program that runs from 9 am – 2 pm weekdays. Children can attend full time or part time (three days). Please note camp will be closed on July 4 due to the holiday. Summer is a chance to play, rest and enjoy a change of pace. The shift in environment and pace can be more challenging for children with autism or other sensory processing disorders. A director of a resource center for autism shares some creative ideas for summer fun for kids on the spectrum or kids who are simply sensory sensitive. Summer fun starts with embracing exploration with new sensory activities, which may help improve sensory processing while reducing stress. Get outdoors and pay close attention for signs of frustration or overstimulation so you’ll know when to take a break. Try seasonal foods through cooking activities. A farmer’s market may overwhelm some kids, but you can always bring summer fruits and vegetables home to try. Prepare them together in your kitchen or try campfire-style, explaining what to do step by step. Sandboxes make for a wonderful sensory play. If you don’t have one, create your own sensory table or bucket with any large container (i.e. a small plastic pool, a large plastic storage bin) and fill it with sand or water. You can also include some natural elements to discover within it, like flower petals or small toys. Consider sensory needs with swimwear and sunscreens. But soft fabrics and fragrance-free lotions or sprays. Apply before you leave the house for the day or start a new activity. If your child is sensitive to some of these safety measures, then try alternatives like sun hats, sunglasses or soft, sun-blocking shirts. Schedule a time to safely swim together in a pool. Borrowing some time at a friend’s pool or scheduling private swimming time at a local pool (much like scheduling a private swim lesson) may help your child ease in and enjoy. Swimming helps with body awareness (if you want to get technical, we call this proprioception) and tactile input. Build an obstacle course together in your yard or at a familiar playground. Go to the play-ground and have fun.